The warm, quiet and relatively calm weather along the front range means most think there as not been much to talk about as far as weather the last few days, but nothing could be further from the truth! There are a few things happening over the next several days and into the next few weeks that look interesting. The biggest thing you will notice will be the incredibly warm temperatures over the next few days. These warm temperatures will affect most of Colorado, mountains included. 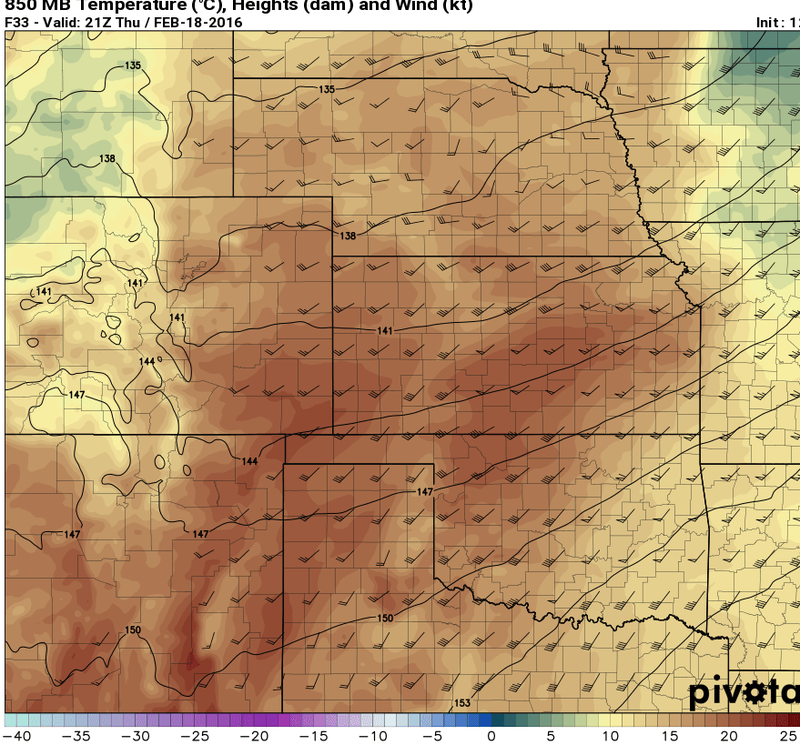 The Nam4k model shown above shows temperatures along the front range comfortably in the 70’s and even some 80’s across the Southeastern part of the state. All models are in agreement that the Wednesday through Saturday period to be abnormally warm, with Thursday being the most notable. Believe it or not, these stretches of well above normal temperatures are not entirely unusual in February. I went back and looked at data last year from my weather station in Castle Rock and noticed we had a very similar warm period. This is a pattern we see quite often in Colorado right around February. As a Colorado Native I can tell you it is often no surprise to recall wearing shorts and a t-shirt to school in February as a child. The pattern we are seeing now marks a transitional period, where we begin to come out of the extended colder and snowier period of winter and begin to make the (sometimes slow) transition into spring. The key to watch during this period is if it indeed transitions into a wetter spring period. Sometimes we never hit that switch and we experience extended abnormally dry and warm weather into spring and summer. This is usually bad news for our snow-pack, water storage and fire season. Luckily, I don’t see that as the case this season, the why is a long story best saved for another day and another post. It may be difficult to imagine any threat of wildfires with all the snow and moisture we have had this year, but the main thing to remember during this time of year is that when vegetation is dormant, it can easily catch fire. This is especially true if you have strong winds and low humidity, which we have experienced now for a couple of weeks. Basically, to sum up these alerts; A Fire Weather Watch means critical fire conditions will be possible. The strong winds and low humidity on Thursday will allow any fires that start to spread rapidly. Probably not a good idea to do any outdoor burning. The High Wind watch means conditions may develop that allow for strong and damaging winds. Driving, especially for high profile vehicles could become difficult. We will keep an eye on this and let you know if any of these are upgraded to warnings. Wednesday expect warm temperatures and calmer winds. It may still be a bit breezy in some areas but will be a nice day overall. Thursday expect a possible record warm day. Strong winds and very low humidity will make for a nice day temperature-wise but probably a bad hair day. That’s it for now folks, I will have another post up Thursday with a more in-depth look at this weather pattern and went we might see a change. Stay tuned!